Near-vent organisms at the Lau Basin. 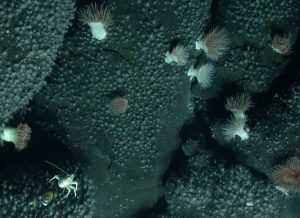 Ecological research at hydrothermal vents synthesizes physical oceanography, chemistry, geology, and mathematical modeling to answer biological questions. Hydrothermal vents have an extremely patchy distribution, and the relatively large areas of inhospitable habitat separating vents mean that physical processes are vital to transport larvae between the “islands” of vent habitat. Buoyant plumes of hot hydrothermal fluid rise from vents and entrain near-bottom water, carrying it several hundred meters above the seafloor before spreading laterally. For the planktonic larvae of vent organisms, this dispersal pathway is an alternative to transport in near-bottom flows, and facilitates long distance transport and colonization of new habitats. Though near-bottom currents are the major dispersal mechanism, entrainment into a buoyant plume is adequate to transport a significant proportion of the larvae produced by a vent community, and is likely a vital component to the long-term survival of populations and communities at hydrothermal vents. The plume elevator dispersal pathway is efficient along linear mid-ocean ridge crests where flow is topographically steered. In the Lau Back Arc basin things may be different, geologically, physically, chemically, and biologically. Plankton samples from the vents were collected with a MOCNESS net on an April 2005 cruise and further reproductive data on cruises in June 2005 and September 2006. Graduate student Kyle Reynolds completed a thesis entitled "Reproductive strategies of the dominant gastropods of the Lau Basin hydrothermal vent system: Alviniconcha hessleri and Ifremeria nautilei" and authored a scientific publication about a new larval form in the gastropod Ifremeria nautilei. Stacy Kim and Kamille Hammerstrom published a research paper about community zonation patterns of sponges, anemones, seastars, brittle stars, gorgonians, and hydroids along the Lau back-arc spreading center.